the Mk 80 (series) bombs. The adapter booster is externally threaded for installation in the bomb fuze well and internally threaded for installation of the fuze. The casing contains the booster charge that is threaded onto the base of the adapter. The M148E1 adapter booster is similar in external appearance to the earlier M148/T45 (series). 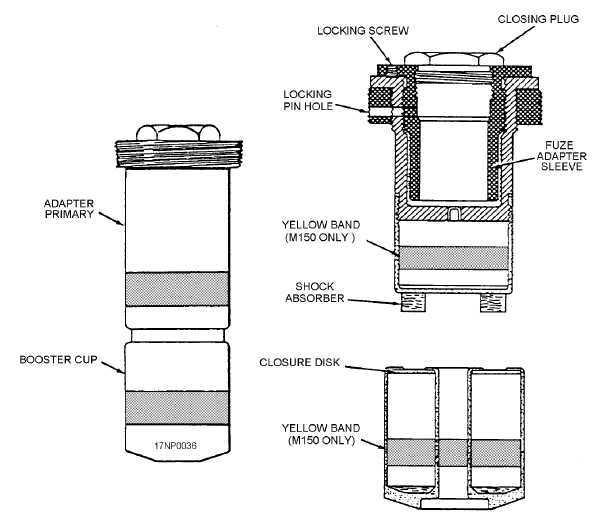 The differences are the nomenclature marking on the face of the adapter booster collar, the words THERMALLY PROTECTED in bold black letters, and a yellow band around the adapter booster casing, which indicates that it is loaded with explosives. The M148E1 was developed for use with thermally protected bombs. Adapter booster M150/T46 (Series) The adapter booster M150/T46 (series) (fig. 1-5) permits the use of mechanical tail fuzes with Mk 80 (series) bombs. The M150/T46 adapter boosters differ only in internal construction, and they may be used interchangeably. REVIEW NUMBER 3 ANSWERS A1. The Mk 20 is used with the Mk 339 mechanical time fuze. A2. The primary and option delays can be changed by adjusting the primary and option time-setting dials. A3. You can tell if the fuze has shifted from the primary to the option delay by checking the time setting observation window of the fuze. A4. SafeGreen foil is intact. ArmedGreen foil is pierced by the indicator pin. The M150/T46 (series) adapter boosters consist of two separate explosive components. The primary adapter booster receives a 2.0-inch diameter fuze. The T46 (series) contains a fuze adapter sleeve for use with the 1.5-inch diameter fuze. A hole is drilled through the threads of the primary adapter booster for insertion of a 1-9 Figure 1-5.Adapter-booster M150/T46 (series).